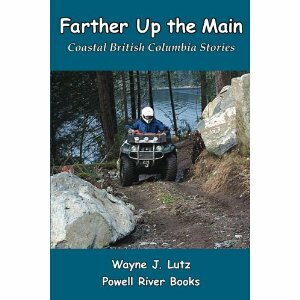 The newest book in the Coastal BC Stories series by Wayne J. Lutz lets you know more about what it's like to live off the grid. 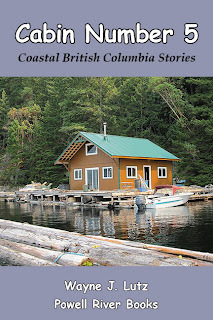 We were true city-folk when we bought our cabin, but have learned how to generate our own power, use propane for appliances, maintain a kitchen garden, live in harmony with nature, and exchange our hectic lives for a more simple lifestyle. If you've ever dreamed of living away from town in an off-the-grid cabin, you'll enjoy reading Off the Grid. Check here if you need a Kindle or Kindle App. When we purchased our float cabin, it came with propane lines installed. In the city, we were used to natural gas for heating and appliances, but propane in large tanks was new and a little scary. 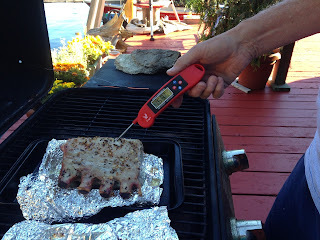 Now that we are more comfortable with propane, we use it for the stove, a refrigerator, lights and other applications. Wayne at the outdoor propane shed. Getting propane up the lake is a lengthy process. Empty tanks go for a boat ride down the lake. Because they are light, we can hand carry them up the dock to the truck. At City Motors or Vanderkemps they become heavy with compressed gas. Back in the truck, the process reverses. A dolly moves the heavy tanks back to the boat for their ride home. We use 20 pound tanks for our BBQ. There's nothing like a grilled dinner on a cold winter night. The front porch gives Wayne a protected spot to work his dinner magic. A 20 pounder costs $22 and lasts about three months. That's pretty economical. We use 40 pound tanks for lights, refrigeration and cooking. A 40 pounder costs $44 and lasts about a month. Again, that's an economical source of energy. We found an auto-switch Y-valve for continuous propane distribution. It's tough in winter to generate enough solar power to run electric lights for more than a short time each night. Even on a sunny winter day we only get about two hours of direct light. Our winter alternative is propane light. In our kitchen we have a Premier propane range. It has four burners and an oven with two racks and lots of room that makes baking easier than in my old oven. The pilot lights use minimal propane and make cooking easy. 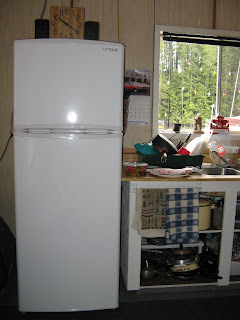 We upgraded our old 8 cubic foot fridge to 13 cubic foot Unique propane refrigerator. Now we have all the refrigerator and freezer space we need. How does a gas flame create cooling. 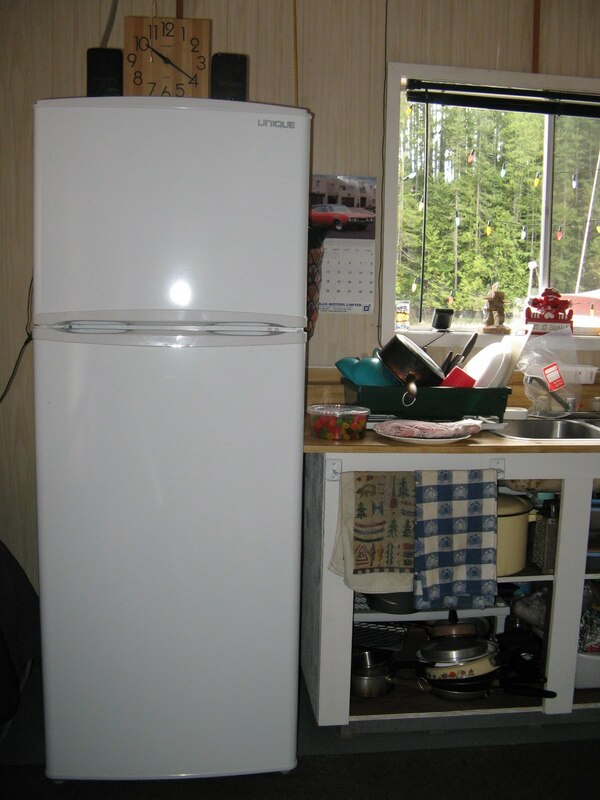 The Gas-Fridge.com website says: "The basic principle is through evaporation. An ammonia mixture sealed inside the cooling unit is heated by a gas burner, which causes it to circulate before it evaporates and creates a cooling effect." We also use Big Buddy portable propane heaters. 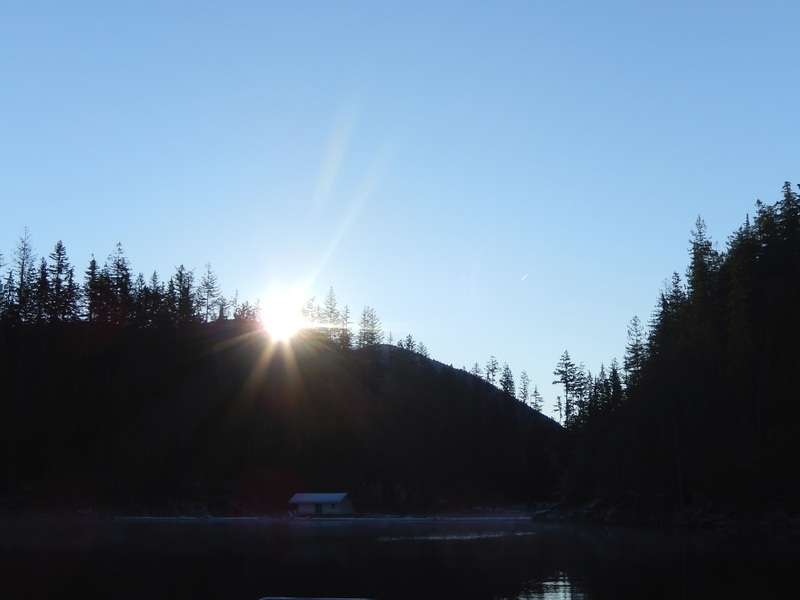 One use is in our Hewescraft during winter to make our 30 minute boat rides more comfortable. It mounts safely in the front of the boat's cabin. It has auto-shutoff safety features and runs on either canisters or a 20-pound tank. A second Big Buddy warms our winter outdoor porch shelter. With a little heat we can still eat outdoors on many nights. Our solar power generation has separate systems for specific functions. Solar panels on our roof facing south. That way our power needs don't have to rely on one source. When we first got our cabin we started small and have grown our systems over time. We've also learned a lot about how electricity works. Our main cabin system has two solar panels. Our oldest one is 125 watts and the newer one is 200 watts. 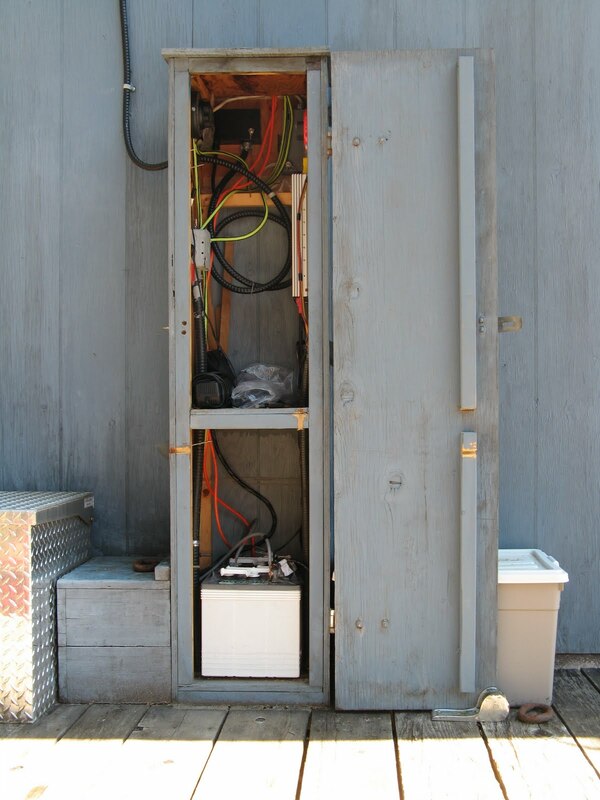 They feed into our electrical panel at the back of the cabin to charge 6-volt batteries wired in serial pairs to produce 12 volts to run our cabin systems. 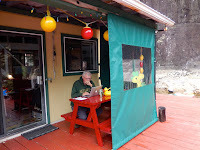 Later we added a separate solar system on Wayne's writer's retreat (boat). The 300-watt panel charges eight 6-volt batteries. This system provides power in the boat and to the cabin via a battery switch in the main electrical panel. 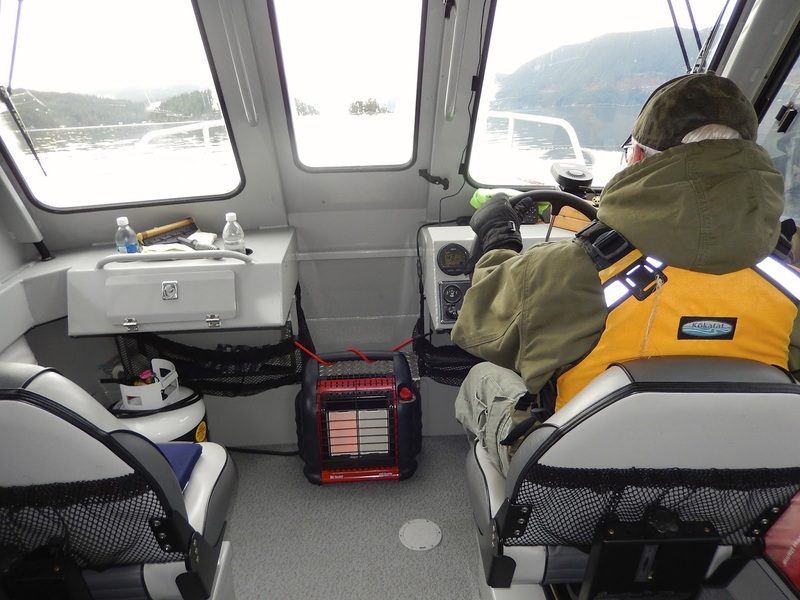 Through our electrical panel at the back of the cabin we can choose to use either our boat or cabin power source. During the day we use Gemini's power and leave the cabin's system charging. Our daytime electric needs are minimal, so the Gemini can charge and supply our simple daily needs at the same time. After dark, we change to the cabin source. That way we never deplete the batteries at either source. We have other solar solutions for specific purposes. The first is on my garden float. A 15-watt panel charges a 12 volt battery that's runs a switch controlled boat bilge pump powering a hose to keep my garden moist in summer. Another solution uses a 60-watt set of panels. It came as a package complete with three 20 watt panels, frame, connectors, charge controller, and inverter. It provides continuous power for the fan in our compost toilet. Installing a new panel on the woodshed roof. Our newest solution is a 40-watt panel to keep the battery charged in Wayne's sailboat. During winter the battery runs low. No battery, no bilge pump. No bilge pump, you get the picture. Even with low angles and direct sun the panel keeps the battery going when we are away. Our separate systems work well for us, especially in the winter when power generation is limited. The float cabin with it's solar panels on the south side. Winters are problematic for generating electricity with solar power. Winter sunrise at Hole in the Wall. After two cloudy days, we can’t use our electrical system without draining our storage batteries below the critical 12.0 volts. We then have to rely on alternative power solutions. 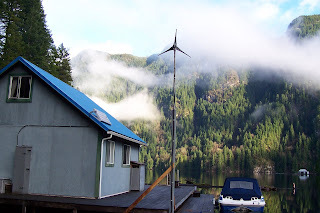 We install a wind generator at the cabin. John and his dad Ed said it was a waste of money. The best place to get out of the wind is Hole in the Wall, but we've been here for winter storms with lots of it. One day we were walking through Canadian Tire with John and there was a sleek Air X model on display. John was sold. The AirX mounted on a John built mast. First we had to decide where to place the unit. The cliff would catch the most wind, but the distance from the float for wiring was too extensive. The outer corner of the upper deck was selected as the most advantageous position. It would catch the wind from the east (storms) through the west (clearing). North winds would be blocked by the sheer cliff in that direction. The AirX with a custom pole mount. The wind generator did not come with a mast. John created one from a hand-milled 4X4 twelve feet high topped by a galvanized pipe going up an additional eight feet. All of the components, including the heavy electrical cable, were salvaged from John’s shed or the local recycling yard. That’s the great thing about John, he can make something out of nothing in true British Columbian style. 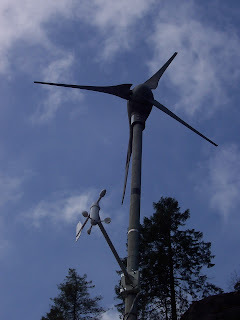 The wind generator is connected into our cabin electrical system. We can charge our storage batteries using both solar and wind power. Now, when it's dark or cloudy, we hope for wind. It takes speeds of 10 mph (16 kph) for our turbine to generate enough power to start charging. But now you’ll hear us cry, “We’re making electricity” on a cold stormy night rather than our old song, “I wish the wind would stop!” At least until it reaches 45 mph (72 kph). That is the speed when the blades stall to protect the unit from internal damage, and we hold on tight and hope our cables to shore don’t break. When all else fails in winter, we resort to a gas generator to keep our battery banks charged. We have an additional large capacity generator that is only used for running large tools such as our electric log splitter in the woodshed. It's so rarely used that the tank never seems to run dry. Here's some additional reading about our alternative power solutions. You’ve heard a lot about our alternative power generation. Do you have a system that you want to tell us about? We are always looking for new options. 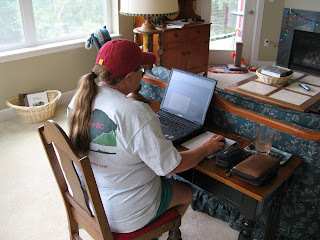 Float Cabin Living : Do you have a telephone? Our float cabin home on Powell Lake, BC. 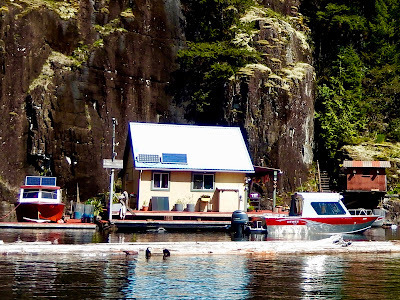 One thing we really like about our float cabin is that it's off the grid. We have all the comforts of home (because it is), but with simplicity. A telephone makes our life in a remote area more comfortable. It provides a measure of safety that wasn’t available to pioneering families, but we keep our calls to a minimum so they don’t interrupt our lifestyle. Here's what we use. 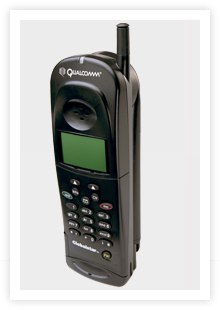 We started with a satellite telephone for emergencies while flying. An advantage of satellite service is it works outside of landline and cellular areas. In North America there's Iridium and Globalstar (the one we used). Disadvantages include high cost, outdoor use unless you have an external antenna, you need good sky exposure for optimal signal strength, and signal degradation occurs in rain and wind (when we wanted it the most!). So next we explored cellular options. Our cabin is at the ragged edge of cell reception. Digital coverage reaches 5 to 8 miles. To improve our connection, we added a Wilson cell booster package with an external antenna. Indoors there's a powered booster and an antenna to distribute the signal a sort distance. Cellular advantages for us include: a more consistent indoor connection, lower overall cost (by no means cheap), and we don’t have to stand under an umbrella juggling a phone to keep it aligned with a satellite on a windy, rainy night. 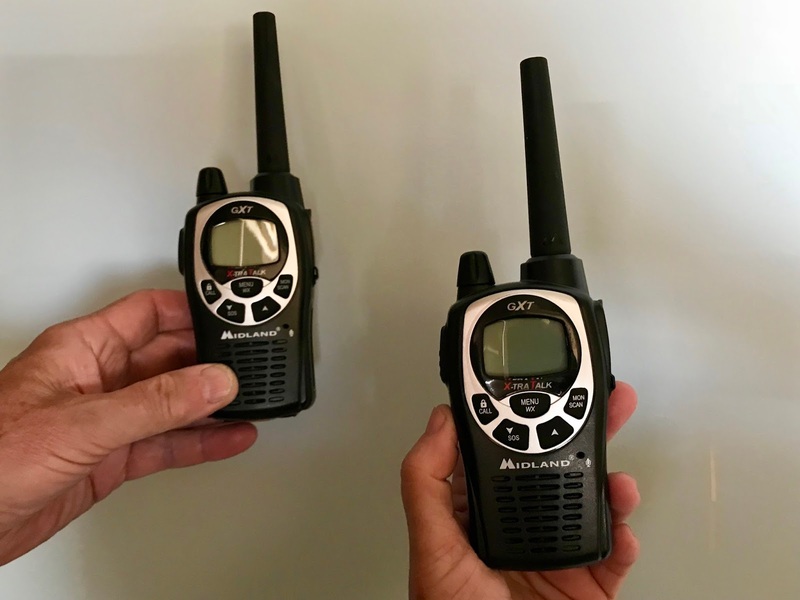 Two-way radios have a price range from cheap with limited range and frequency controls, to expensive. We chose a Midland GXT1000 that has a range of 36 miles. We use these on hikes and quad rides. 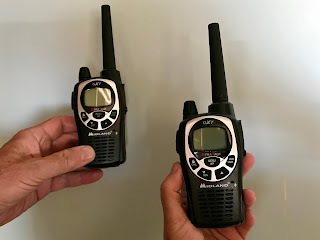 Walkie-talkies have a push-to-talk button and only one radio can transmit on a channel at a time. They are not private. Anyone within range on your channel can listen, but in the bush they are handy. Marine band radio in the barge at the cabin. Two-way radios allow you to send and receive. Advantages include: some are cheaper than cell phones, there's no service contract, and no monthly charges. Disadvantages include: you can only communicate with someone on the frequency you are using, they are limited by distance, and calls are not private. Antennas and base stations can extend the range. 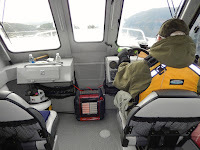 We use three handhelds, one for boating, one for logging roads, and one in the plane. In addition, our barge has a marine radio that works on the lake. 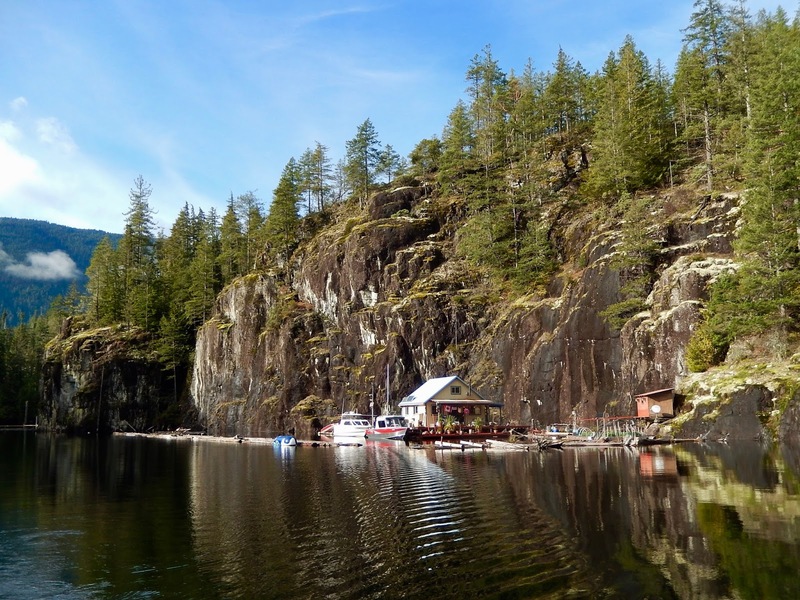 Float Cabin Living: Do you have television? Our new TV monitor portable entertainment center. I grew up in the golden age of television. In those days the sets were big, pictures were small, programming was limited. To change the channel, you had to walk rather than click. Those were the days. The TV monitor when not in use. 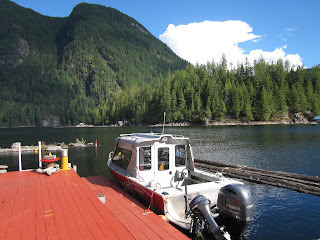 When we got our float cabin, we decided not to have television for several reasons: satellite TV was our only choice, the monthly cost was $90, and it would use up limited electricity. Most importantly, we didn't want it to intrude on our tranquility. Television used to be stand-alone. Now it's linked to the Internet. In 2017, Xplornet satellite Internet brought us some television capabilities. Using a Slingbox device we can link to our TV service in town. We can also watch streaming channels via our laptop. Aligning Xplornet satellite Internet dish. To save our data plan allotments, we watch movies and shows saved on our laptop. Netflix allows us to download programs in town to watch later. To make viewing easier we use an HDMI cable to a TV monitor. Our real life "TV" front door. Best of all we have a "real" TV, our sliding glass door. Radio helps us keep in touch. 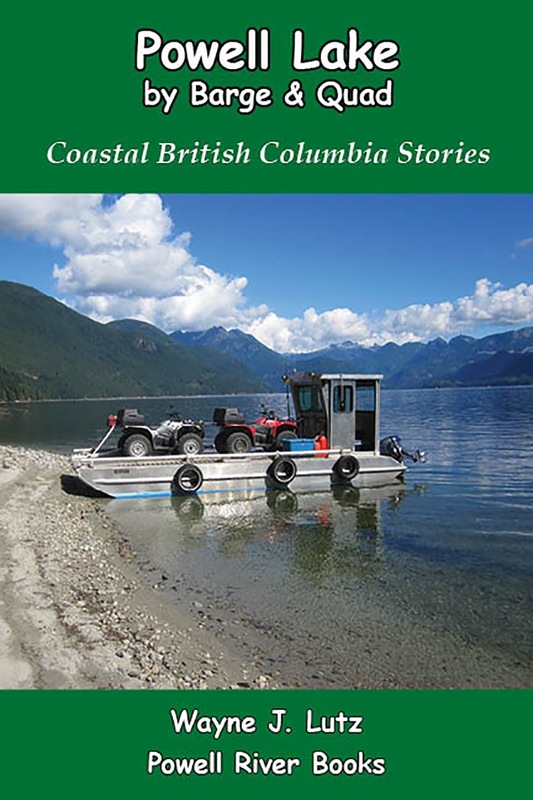 We listen to Powell River (Coast FM and JUMP) and beyond. With SiriusXM satellite radio we can't SEE Anderson Cooper, but we can HEAR his every word. 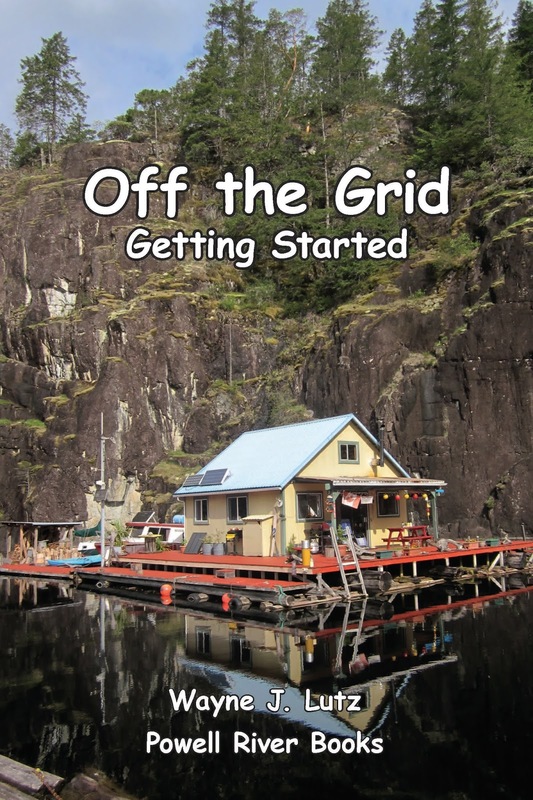 More posts about off-the-grid television and entertainment. Float Cabin Living: Do you get Internet? Being a wirehead in town. You can probably guess our decision. Wayne and I spend an inordinate amount of time online in town. There's e-mail, my blog, Facebook, Instagram, book business, not to mention comments on others' posts. When we're at the cabin we don't want to be wireheads, but we do want to be connected. Over the years Internet access up the lake has evolved. Some solutions have been effective. Some less so. All come with a hefty price tag. Cell phones can be used to access the Internet. One method is to use data services offered by a cellular provider directly on your device. Signalboost Desktop cellular connection at cabin. You can also use a smartphone as a wifi hotspot for your laptop or other Internet capable devices. Another option is get an Internet key to plug into a laptop or a cellular wifi hub. When we installed satellite Internet we discontinued this service. These days, all cellular companies have data plans. We use Telus and Verizon. Even though we still use cellular data as one solution, the disadvantages are high cost and even with a cell booster, our connectivity is sometimes slow or non-existent. Two-way (download and uplink) satellite Internet can be accessed as long as you have a view of the southern sky where the satellites are in geostationary orbit. Globalstar is the provider in our area. This has been the best solution for us. 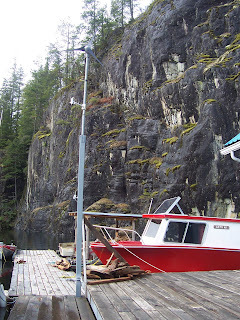 Our Xplornet dish attached to the shed on shore. We waited until 2017 to install high-speed Xplornet. We've been very happy with the service. Our plan includes 100GB at 25 Mbps for $100 plus device rental and taxes. That's enough for us to stream a few movies a month, watch some Internet-based television, web surf, conduct online business, and e-mail. A house is only as good as its foundation. The same is true for a float cabin. Even more so. 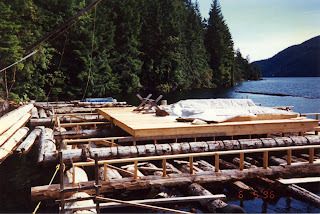 Our cabin's float during construction in 1997. The float is the most critical component of cabin construction. It must be skookum (strong). 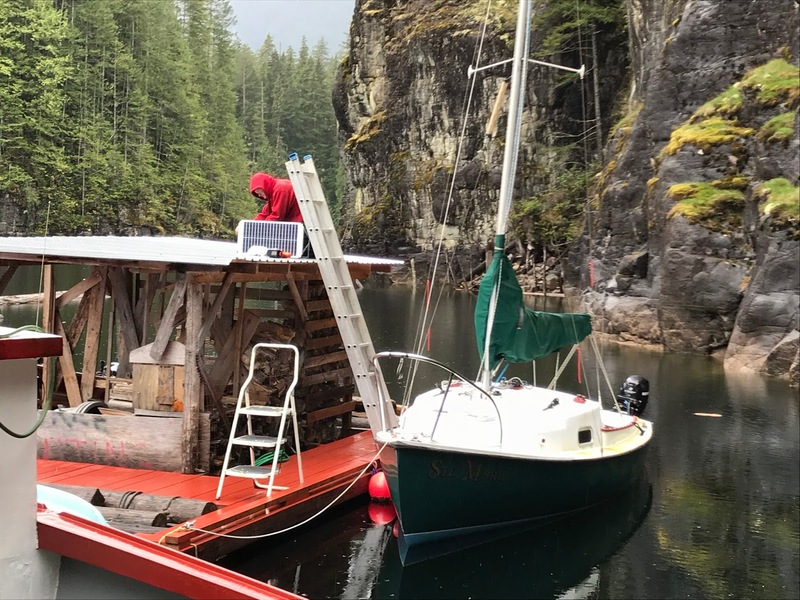 It has to float high enough out of the water to support the weight of the cabin and everything else you put on board (and that builds up over time!). If your float sinks too low or off balance, there goes your cabin. 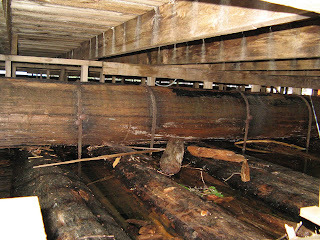 Looking under our cabin at the lashed float logs. Our float cabin was built by our good friend John. His first task was to construct a 40' x 40' cedar log float. Cedar is preferred because it's more resistant to decay and is buoyant longer. Cedar logs that long are hard to come by. 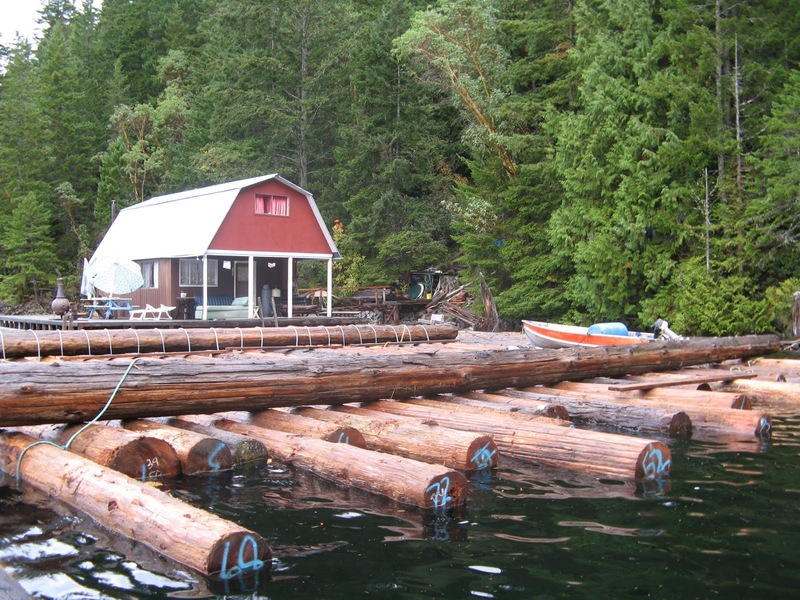 You must purchase an old float and redo the logs, or purchase new logs that are expensive and hard to find! John made our float with logs from an old float he deconstructed. John, his dad Ed, brother Rick and nephew Chris at work. Read "Never Saddle a Dead Horse" in Up the Lake for the details. We purchased our cabin already built, but got to watch the process when John constructed his own replacement cabin. Building a new float at Cabin #5. These are the logs John purchased for his new cabin. You can see the logging company stamps. Two brow logs are placed on top and perpendicular to the float logs. John's dog Bro standing next to a brow log stitched in place. Then a long heavy steel cable is wrapped over the top of the brow log and under and around each float log. Over, under, over, under. Once in place, the cable is tightened with a winch and hammered in place with railroad spikes. 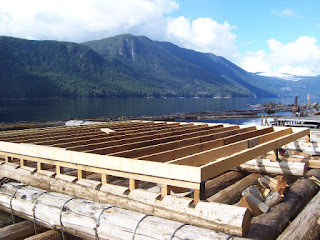 The cabin foundation is supported by additional logs and posts. 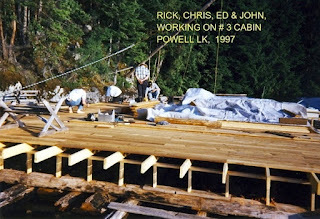 Additional perpendicular logs are attached to the float logs so upright boards can be added to support the cabin foundation and decking. It's important not to attach your cabin floor or deck to the brow logs, or allow the cabin floor to extend over them, to allow for repairs in the future if needed. The cabin floor is installed first. First comes the floor for the cabin. John uses 3/4" plywood. If we built another cabin for ourselves (which we won't), I would insulate the floor. The cabin cools from the bottom up. The plywood cabin floor is added first. And 1x6" cedar boards are used for the decking because they are the longest lasting. Bro surveying the new cedar deck. A small space is left between the cabin floor and decking. That makes it easier when it's time to replace the deck, usually in about 20 years. 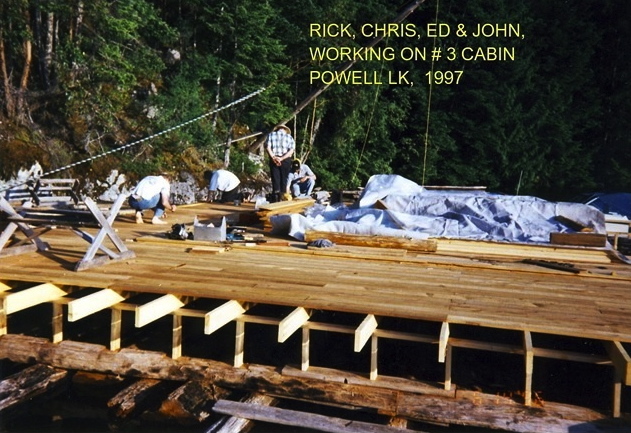 Once the deck in in place, cabin construction can begin. After time, even cedar float logs become saturated. This causes them to sink farther into the water. Then they become even more saturated. It's a vicious cycle. To prevent this, additional flotation is needed. Way back, more cedar logs were shoved underneath by big boats or tugs. We saw evidence of this practice on an old float at Rainbow Lodge. Sink a barrel to place it under the float then filled it with air. Today, plastic barrels, totes and Styrofoam are used. Fifty-five gallon blue barrels are the most popular, but 300-gallon totes are becoming more common. Unfortunately, their aluminum frames tend to disintegrate after five or so years. A blue barrel tucked under two float logs for extra flotation. Following winter storms, you find a few blue barrels floating on the lake. They have a tendency to pop out when cabins rock and roll in wind and waves. A common winter pastime is beachcombing for barrels. Who knows, the barrel you find may be your own!! Available Online: "Farther Up the Lake"
Float Cabin Living: Can you have a garden? 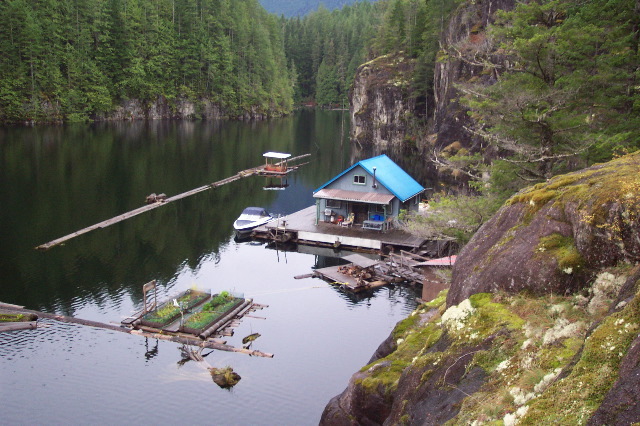 Float Cabin Living: What Do You DO? Float Cabin Living: What about a bathroom?